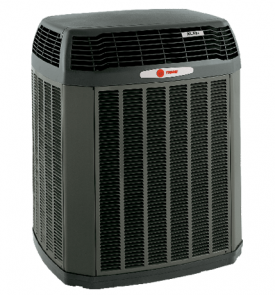 Trane is an HVAC manufacturer that is renowned for durability, a trait that the company advertises in its “It’s hard to stop a Trane” tagline. 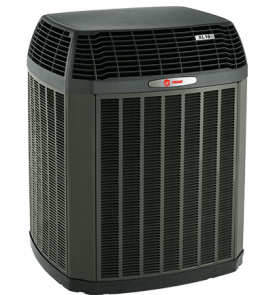 According to the brand, a Trane air conditioner is sold every minute of every day, likely due to the company’s focus on quality. Its long-running success has made Trane one of the most prolific companies in the industry, with more than a hundred manufacturing facilities located in 28 countries. One of Trane’s manufacturing facilities is located in Tyler, Texas, along with the company’s test labs. Here, Trane puts its residential and commercial HVAC systems through a battery of tests to verify the unit’s capabilities. The testing protocol lasts for 16 weeks, alternating between two weeks of extreme heat and two weeks of extreme cold. By the end of the test, the unit has been through five years of simulated wear and tear, so Trane technicians know where improvements can be made. The brand has taken the testing several steps further in some cases, subjecting their equipment to explosive forces, floodwaters and even simulated lightning strikes. Trane also has an anechoic chamber (a completely soundproof room) that it uses to test the noise output of its HVAC technology. This round of testing helps Trane’s engineers determine how to make the unit quieter. Trane takes its product testing to the next level, and it has resulted in a product that can keep running even in some of the most challenging conditions. 1. The XR Series – The XR Series is Trane’s economy model, though it still provides a level of energy efficiency that far exceeds what’s operating in most homes. The XR Series can achieve SEER ratings that range from 14.5 to 18, making them some of the most energy efficient value models around. Even at Trane’s lowest price point, property owners can boost their energy efficiency and savings. The SEER rating refers to the system’s energy efficiency, which is determined by measuring the amount of cooling provided with each unit of energy spent. The SEER process simulates expected loads during hot, humid days. The Trane XR Series is also built with the Climatuff compressor and Spine Fin coil, which is among the most efficient heat exchangers on the market. Also standard are the corrosion resisting WeatherGuard zinc-coated fasteners, and the DuraTuff base pan, which resists cracking, warping and rust. Finally, the XR Series comes with galvanized steel louvered panels and a powder-paint finish, both of which will protect internal components and ensure the unit withstands the elements with ease. 2. The XL Series – The XL Series is a step up from the XR Series, though it offers SEER values that are mostly equivalent. What helps it stand out is the addition of a two-stage compressor and an advanced fan system with sound insulations. The two-stage compressor is a fairly new addition to the industry and allows homeowners to run the air conditioner in a low capacity mode, which conserves energy while providing some degree of humidity and temperature control. The second stage is a max cooling mode, which ensures the home remains comfortable even during the hottest days of the year. Trane can also add its CleanEffects system to its XL air conditioners. CleanEffects is an advanced form of air filtration that better handles pollen, dust and other airborne contaminants. This can offer some relief for people that suffer from seasonal allergies. 3. 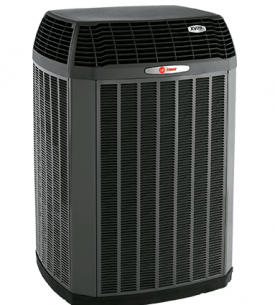 The XV Series – The pinnacle of Trane technology, the XV Series offers the highest SEER values (up to 22) and provides a couple of premium features. The first is its TruComfort technology, which uses a variable compressor for extremely fine control over the home’s temperature. It is capable of 700 stages of cooling, from 30 percent to 100 percent capacity, and the TruComfort compressor switches between these stages automatically, responding to changing conditions in the building. This ensures the system is always providing the perfect mix of cooling and energy efficiency. The XV Series is also built with the ComfortLink II, which monitors system usage and performance. If there are any hiccups in operation, the ComfortLink II will send a notification to the homeowner and make it easier to deal with technical issues as they emerge. This is also helpful for any responding technician, who can pull data and alerts from the ComfortLink to speed up maintenance and repairs. 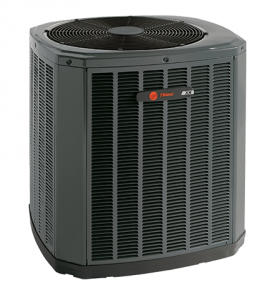 Trane air conditioners have earned their reputation for being rugged, reliable pieces of technology, and as long as they are installed by an experienced contractor, Trane air conditioners will last a long time.